In amongst things the things I’ve haphazardly collected (and I use the term loosely) over the years is this postcard. The image looks familiar to me, as if I remember actually seeing it — but I think that might just be because I’ve looked at this postcard so long. The first thing that popped into my head when I saw it was “turnpike,” but until I read up on the history of local highways (my days are fun-filled! 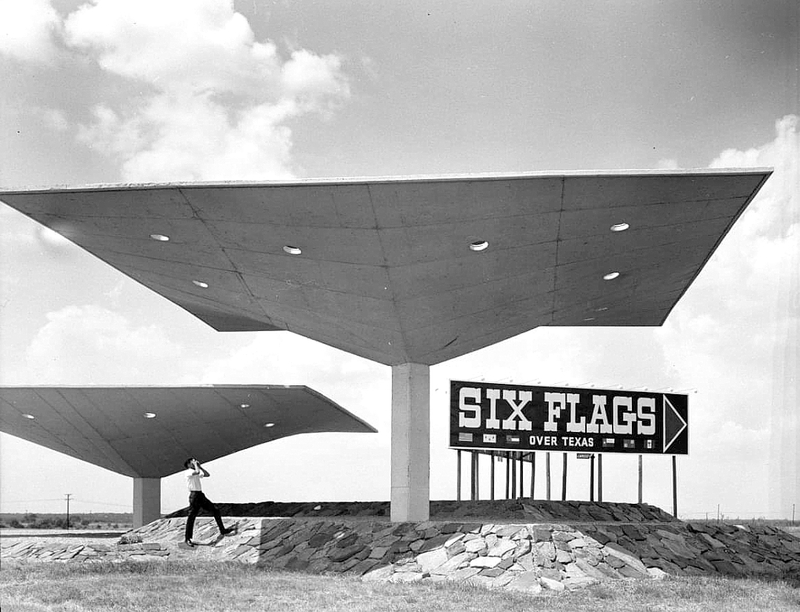 ), I wasn’t entirely sure where the turnpike had been other than “the other side of downtown, toward Fort Worth.” Did I ever see this sign and attendant weird looming structures when I was a child? Unless it was still up in the ’70s, I probably didn’t. So what is it? But … “hyperbolic paraboloids”? Those things are so cool. 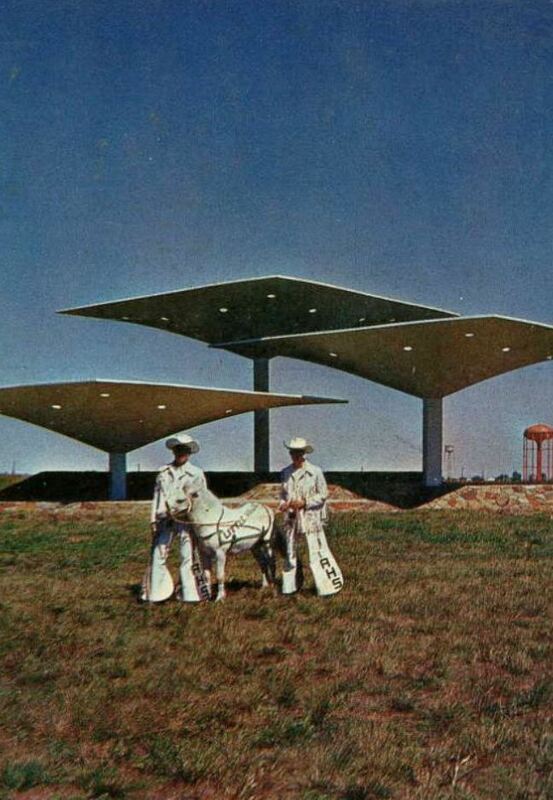 The “hyperbolic paraboloid” was developed by Mexico-based Spanish engineer-architect Felix Candela who worked in the Dallas area with the great architect O’Neil Ford (on, specifically, the Great Southwest Industrial District and the Texas Instruments Semiconductor Building). Candela is pretty interesting — look him up. Without Candela’s paraboloids and his contributions to engineering and architecture, Santiago Calatrava probably wouldn’t be doing the sort of thing that he’s doing. I’m still trying to figure out if I ever saw that fantastic sign and those three silent, looming paraboloids. It’s all pretty cool-looking, and it must have been an unexpected sight in the middle of what was, then, basically nothing. Photo of Calatrava and Candela from the blog An Engineer’s Aspect, here. 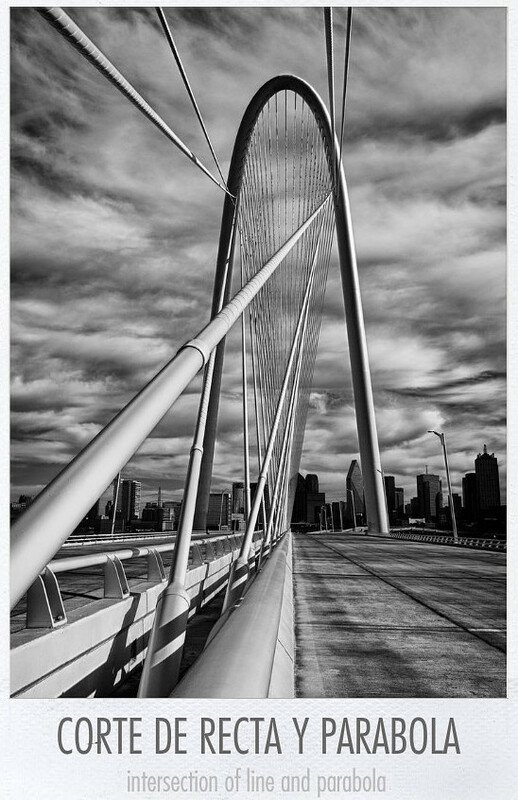 Photo of the Calatrava bridge from Pinterest, here. A good overview of Felix Candela’s work, with photos and a video, is on the Columbia University website, here. 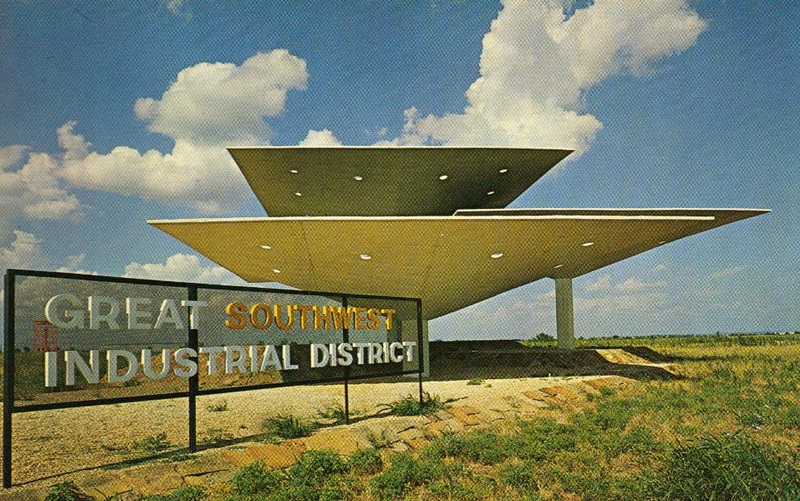 The Great Southwest Industrial District (Arlington and Grand Prairie) still exists, and their website has a history page which explains its creation and development by Angus Wynne, here. Lastly, who could resist reading up on just what the heck a “hyperbolic paraboloid” is (warning: math) — Wikipedia’s on it, here. Some pictures larger when clicked. Are you related to my elementary school principal, Edith Bosse? Thanks! I’ve actually been asked this before, but, no, she’s not a relative. My father’s family is from Indiana. The three remained at the corner of Division and 360 near Six Flags Mall. Sometime after I moved to Houston, they were torn down, maybe when they redesigned that intersection. I believe there is a photo in the AHS 1963 yearbook. I only know that because my dad, as a student photographer, took the photo. Cool! I might be able to find that. Is that Adamson or Arlington High School? Arlington. I have a copy, but it in storage. If you can’t find it, I will look for it once we get moved into our house. Let me know if you find it. I quickly scanned through the Arlington High School yearbooks for 1963-1966 and didn’t see it. Maybe it was ’62 or ’61. He graduated in ’63. Maybe it wasn’t his senior year. Now I want to go pull boxes out of storage. Ha! Don’t worry about it. Whenever you see it again, I’d love to take a look at it! Great job finding it! I still haven’t unpacked all of my books yet. But, if memory serves, my dad did take that photo. I found out he graduated in ’60, my mom was ’63. Hey, Brad. I’m adding this photo to the post, because who doesn’t love a Shetland pony/hyperbolic paraboloid combo? I’m putting your father’s name as Lynn McCorkle (the only McCorkle in the AHS 1960 yearbook). If this is incorrect, let me know. Thanks again for mentioning this — I love the photo!